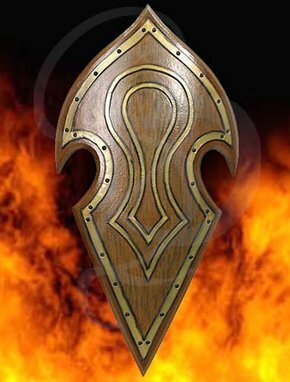 This shield embodies all the elegance of the Eldritch. The curved, wood grained finish is accented with hand hammered and riveted antique brass trim. Features a vertical suede wrapped, hard rubber handle for support and control. The non crack finish assures service for many battles. Please Note: This is not a metal shield; it is a quality latex shield for LARP and other forms of action play.